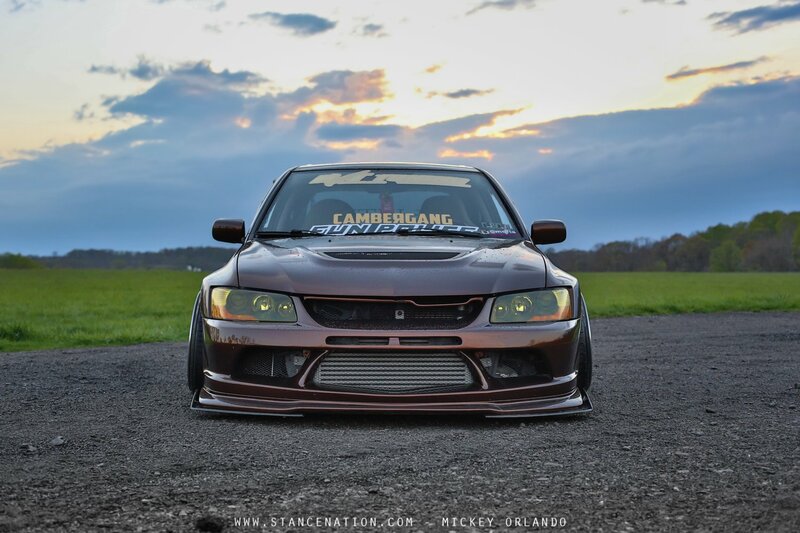 Complete Package // Mickey’s 500+ HP Mitsubishi EVO. Can one ever truly achieve perfection? What does it actually mean to be perfect? Who exactly is the judge of perfection? People will spend their entire lives trying to chase after something they can't obtain. Life is so much more fun when we learn to be ourselves and not who we think others want us to be. Where I am going with all of this is the fact that Mickey Orlando gets it. Mickey modifies his EVO for his own liking, to the tune of his own drum. People these days gain attention by losing respect, but I can say for a fact Mickey is far from that kind of person. He is a true believer of everything being about having fun, taking risks, and doing what makes us happy. Forget about all those followers and likes you get on Instagram and focus on spending more quality time with friends who share the same passion as you. I've been personally following Mickey's build of his EVO 9 for quite some time now, and man has the car evolved over the years! I remember first coming across his build thread on Wrong Fitment Crew (WFC) when I instantly fell in love. Back then the car was quite mild compared to what you see before your eyes today, but it still stood out from most other EVO's. 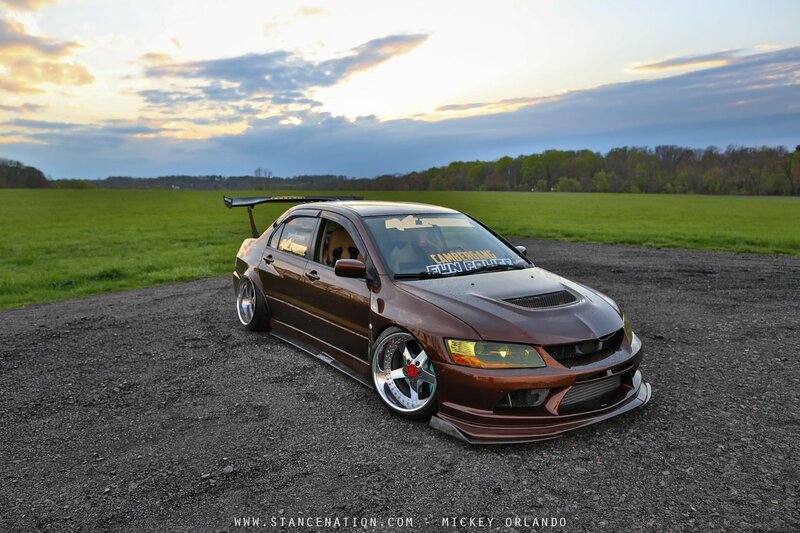 The color of Mickey's EVO is one of many things that grabs your attention right when you see the car. It is very dynamic and changes quite a bit depending on the light. 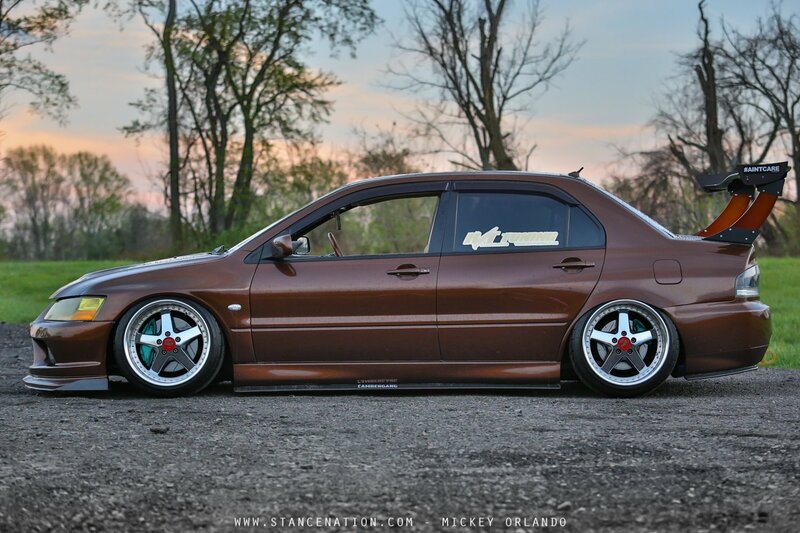 To achieve this exact color, Mickey had to combine a custom mix based on the Toyota's Sunset Bronze Mica, which is one of my favorite factory colors. It's pretty versatile color; Works surprisingly well on a sports sedan, but I could also see it on say big bodied VIP sedans or even a high-end sports coupe. As far as other exterior modifications are concerned, Mickey went with some of the staples for this particular chassis. Up front the EVO is fitted with a Varis front bumper + carbon lower front splitter while the factory USDM head lights were swapped out for JDM ones from a EVO 9 MR, then of course tinted yellow. The new front end is extremely aggressive and does rest of the car's aggressive styling justice. Out back Mickey's EVO is sporting a JDM EVO 9 rear bumper (the one that US should have received from the factory as well!) and it's looking damn good! Mickey also refreshed the rear end with a set of custom tail lights and of course the "pièce de résistance" which is that big wing, courtesy of Big Country Labs (BCL). The wing took the car to a completely new level, a level of love/hate at that. Personally, it's kind of cool being able to see the top of the wing when staring at the car head on if you ask me. 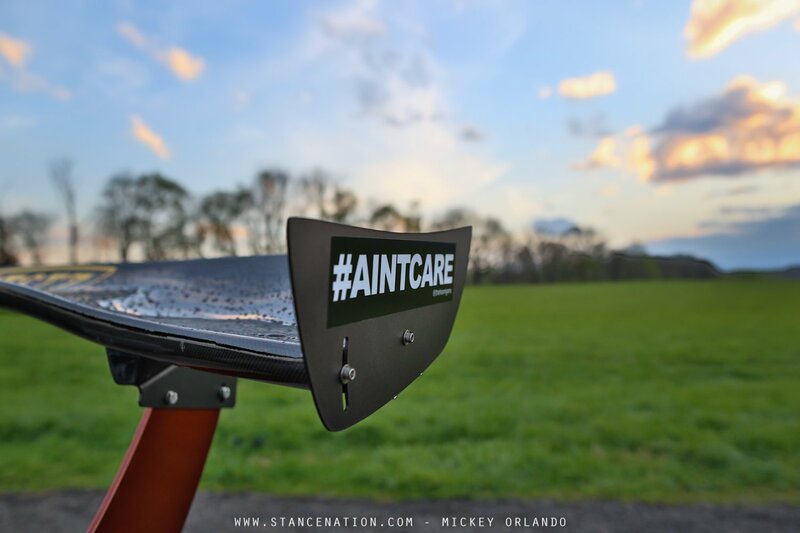 Now it wouldn't be nice of StanceNation to feature a car if we didn't do a fitment check, and Mickey's is right on the money. He is rocking a set of Work Equip's which is not so common on the EVO at all, but once again, Mickey makes stepping outside of the box look so good. 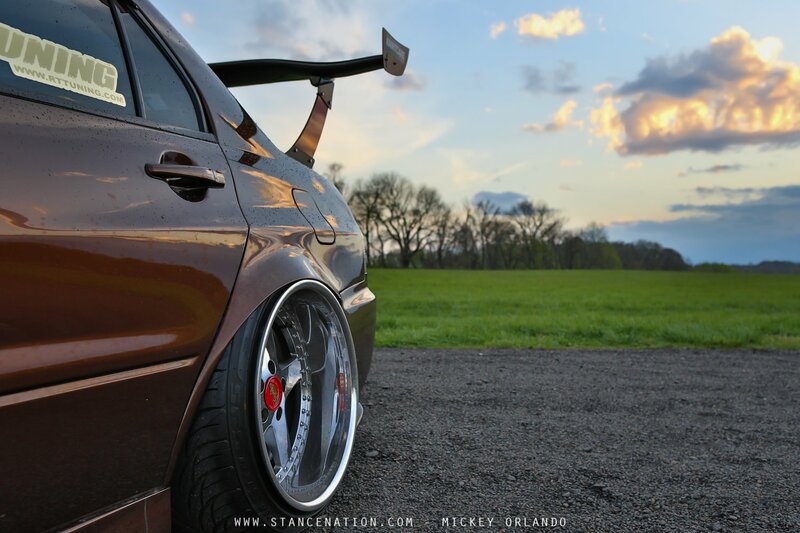 The fitment is dialed in with the help of an Airrex bag system. 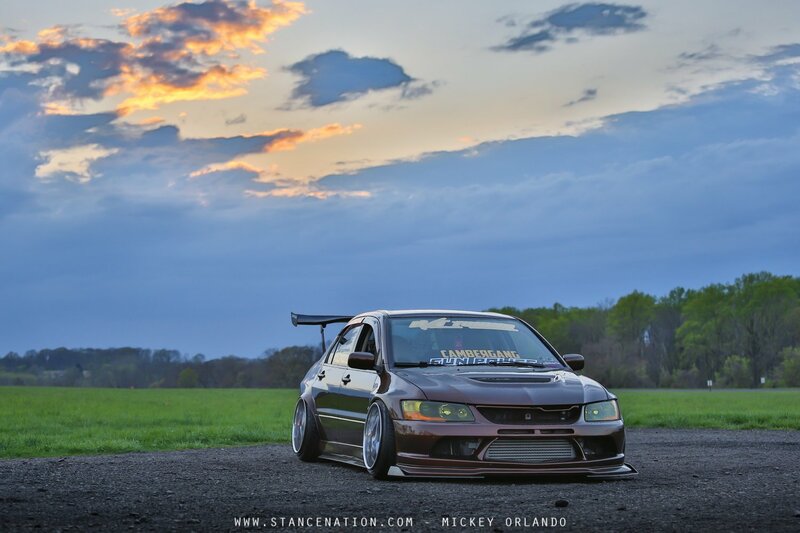 Yes you read that right, Mickey's EVO is bagged! For some reason people are totally against bags on so-called "rally cars", yet I've never ran into someone who could give me a legit explanation as to why, besides the obvious "because it's a rally car!". Pretty silly considering less than 1% of all EVO's and STI's you see on the road are actually being rallied. You and I both know the reason majority of owners by these cars is for their awesome looks and good amount of power. One of the areas of Mickey's EVO that often gets overlooked is his interior, but I must say, if you skip over the interior of this EVO you will be missing out! Starting with the custom Status Racing seats, the combination of saddle and brown leather compliment the exterior of the car oh-so-well. Mickey went an extra step though and got matching rear seats as well! As I always say, attention to detail is what completes the car. 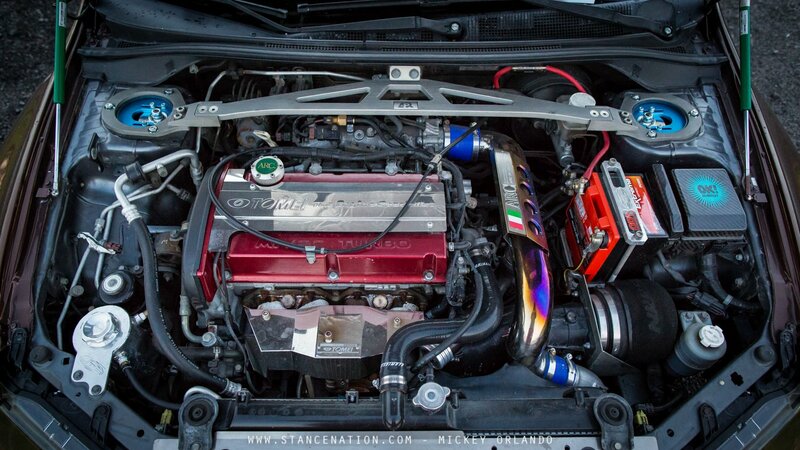 Pop open the hood and you'll find plenty of bolt-ons from companies like Perrin, ARC & Tomei, helping the EVO breathe a little better and make a bit more power. 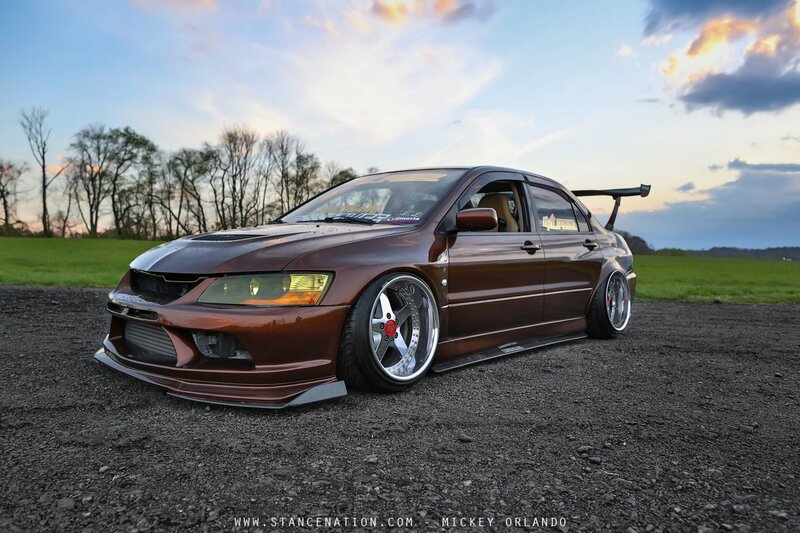 Oh but don't fret, this EVO has just as much "go" as it does "show". With the help of a FP Black turbo, Mickey made a little north of 500 horsepower on the dyno! Plenty of power to shut the yapping gums of an internet warrior" or two. I'm a sucker for a car that is not one-dimensional and Mickey's attempt to balance both form and function paid off big time. At the end of the day, there is no one in life we can totally please but ourselves, so why even bother? Just take a page from Mickey's book and have fun! Don't worry about what the next guy is doing, just do you.